I love your idea about not doing step 4 perfectly because you’ll get to do it again on the next go around. Great idea! My hubby has been working so hard on #4 for about 6 months now. No joke. And I don’t mean intermittenly, I mean all the time he works on it, Sheesh. My motto in life has always been “It’s good enough.” I’m not kidding. I am the last thing from a perfectionist. It’s why I graduated form college with a 2.8 GPA, because hey, it was good enough to get that BYU diploma! It’s why I make yummy dinner but always leave the dishes to sit until tomorrow, or the next night 🙂 . Every perfectionist I have ever known seems a little bogged down with life. That would be very difficult to deal with. God bless. Ahhh the truth always stings!! This is a very powerful principle for me to learn! 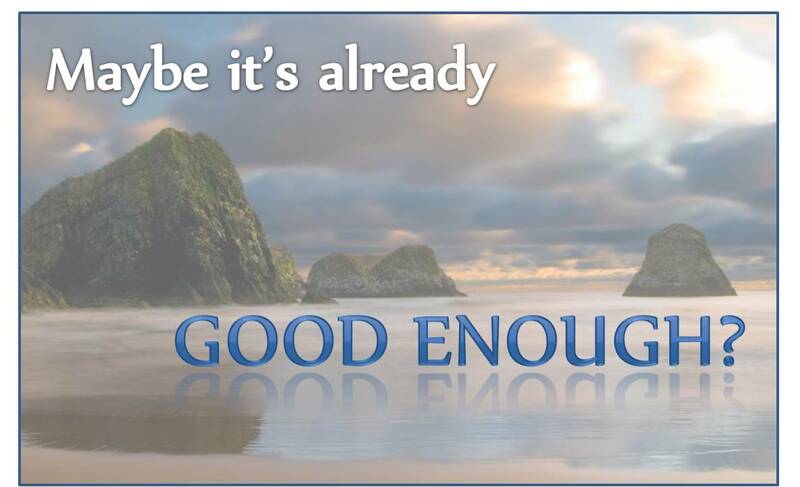 I’m so grateful for the extra reminder of “good enough.” It is such a blessing in my life! This is already making a difference for me. I am wasting less time on unnecessary extra efforts, and I am feeling so much more relaxed and peaceful.